The most enjoyable step in the creative process for me is before any cuts are made or any colour is applied. It is a moment that is risk free, with endless possibilities in which design elements can be freely considered. A piece of wood I have planned to use for a project may sit in my workshop for months. I look it over occasionally and weigh my options. 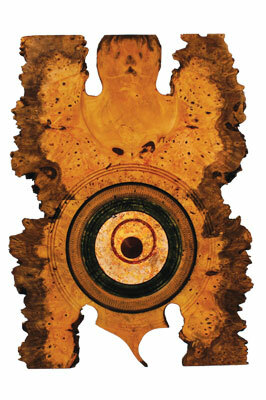 'The Cat's Meow' began with a small slab of buckeye (Aesculus lava) burl that measured 90 x 200 x 305mm. The perimeter was a 50/50 mix of natural edge and straight cuts forming one 90° angle. Although the wood was striking, the asymmetrical shape offered little immediate guidance as to which direction the piece should take. Thickness wasn't an issue, which led me to consider book-matching: I could make better use of the natural edge and hide the straight cuts. I eventually sliced the wood into four pieces, each about 20mm thick, and found a nice orientation for the grain and figure to form the 610mm-tall panel. Whatever design I initially had in mind for this oddly shaped, fat little burl changed once it was transformed into a 610 x 380mm board. The purely natural appearance of the panel quickly took control. I saw a cat. Her face was peeking through the surface of the wood with typical bluish/grey buckeye colour. I embellished it a bit to make it more visible. The late turner Bill Jones wrote in Notes from the Turning Shop: 'The designer, looking for something original, can rest assured that whatever he comes up with, if it's any good at all, has been done, near enough, before. If it really is 100% original it will be hideous'. I always have this notion in the back of my mind. Perhaps the most original element(s) of 'The Cat's Meow' are the four paws. With two feet on the ground and two reaching skyward, I would suggest that this feature came 'originally' from nature. I can only hope to achieve a balance between the influence of those woodturners I so admire and my own attempt at originality.